When you arrive in Hawaii, and start your vacation in paradise, you will find our printed FREE Coupon Book or Adventures and Romance Magazine in various locations around the islands. Grab one for your activities, tours, and charters scheduling with various local advertisers. .
We DO NOT email you any coupons. Your request for “Save coupons-Get info” are automatically sent and added to the advertiser’s email database so they will have a record of your request! You will receive from our website an email with ” Your List ” of coupons. You will not receive any emailed coupons from us. When you find an ad or offer that interests you – tap/click on the page and it will automatically add your selected ad to “ Your List ” located below the flipping pages. NEW FEATURE: “BOOK NOW” button, just go to “Your List” below the flipping pages and to the right of advertiser’s name will be a red “BOOK NOW” button that will take you to that advertiser’s Booking page. You will receive an E-mail from us listing your selection of coupons and your requests will be sent to the advertisers you selected. You will not receive any coupons directly from us or advertisers. As long as the advertiser knows that you saw their ad in the FREE Coupon Book or Adventure & Romance Magazine websites and the offer expiration date is still good, they will honor the offer. You do not need to print out anything. We DO NOT set or schedule dates and times for activities, tours, flights and charters. You must contact the advertiser or click on their BOOK NOW button, for scheduling activities, tours, or charters. 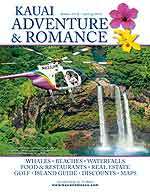 Free Coupon Books and Adventure Romance Magazines are FREE at island-wide locations. Click here to view locations: “Magazine Distribution”.